So, to slake the thirst of our listeners (I write this sarcastically) we've posted some new action pics! 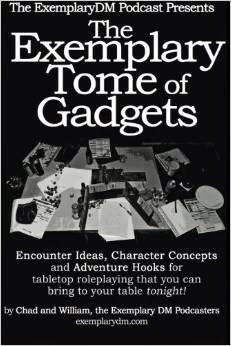 Vignette: Occasionally in my campaign I'll tell all the players to turn their character sheets over, and hand out new ones that I generated myself. Then I'll transport them far away, where they'll fight a single encounter as these new temporary PCs in a plot-important battle. I've used this before to let the players know just how wicked a particular wizard was, or to inform them of critical events going on half a continent away. In this tweet, there's pictures of a vignette where the players controlled powerful Elven Border Guardians, defending against a skyscraperesque Golem Titan ravaging their lands. Just as the Titan was about to crush the Elven Temple they swore to protect, he froze, deanimated for all time. The Elves think that their powerful forest magicks won the day, but the players knew better - their real characters had just destroyed an primal elemental tower deep beneath the surface! Three-table Delve: So, we asked all our DND-savvy friends, and a few n00bs, to join us for some hazing good clean DND fun. Then 12 people said they could make it. So co-denizen Drew and I volunteered to co-DM. Then 15 people showed up, and my gallant wife (see Episode 3) volunteered to run our Delve at the last second. Three rooms, three tables, two rolls of gaming paper and a battle mat. Want to know what our table-blending Delve concept was? We'll tell you all about it in Episode 5! In this tweet, we have some action shots from our three-table massacre, in which I regrettably didn't kill a single PC, not even Chad.